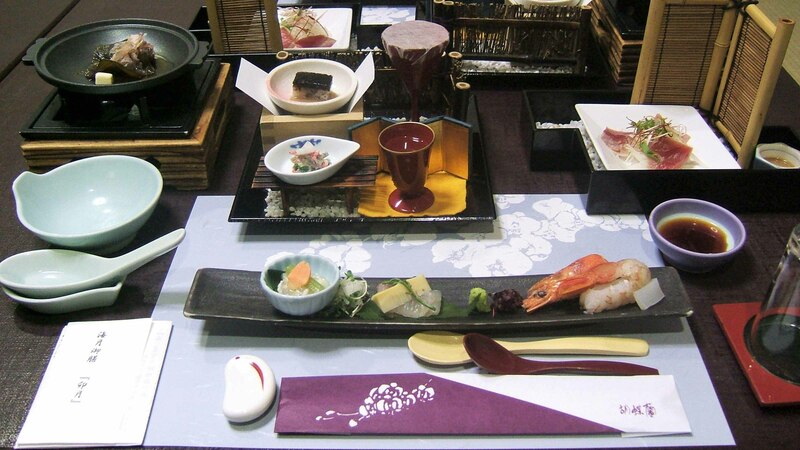 In the first round some plates were displayed in a Japanese Garden theme with a small bench, fence and gravel. Very imaginative. 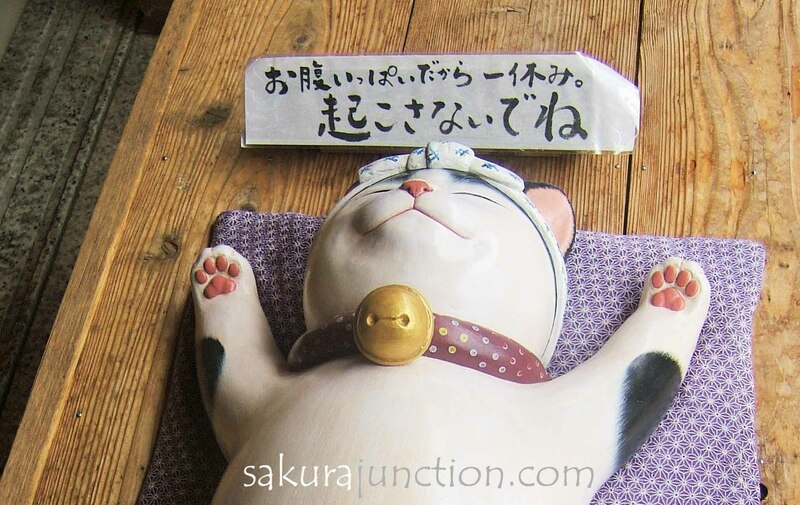 We Japanese say you should “enjoy food with your eyes” as well as mouth. It means display and colour are very important part of food preparation as well as the taste. 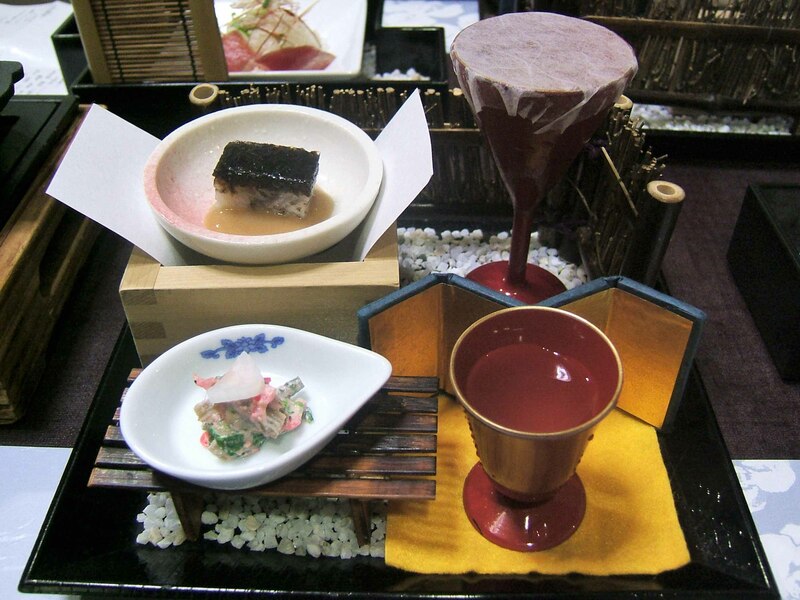 We started from the aperitif ‘Yuzu Sake’ ( ↑ the one in a small red goblet) made with local spring water . There were ‘Mekabu (seaweed)’ cooked on a grill, some mixed staff with fresh Sea Bream and Prawn. 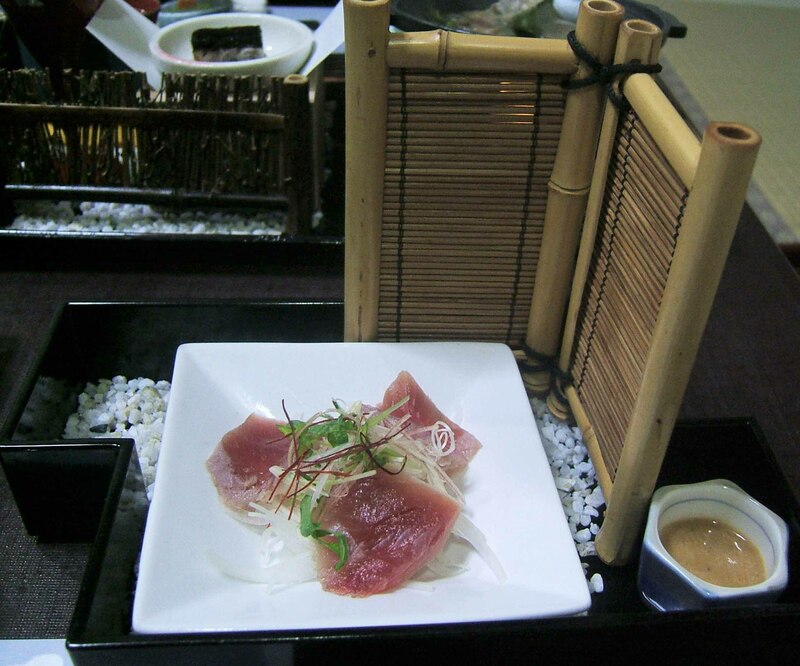 The fresh Bonito Sashimi & Herb with Peanuts Sauce was particularly tasty. 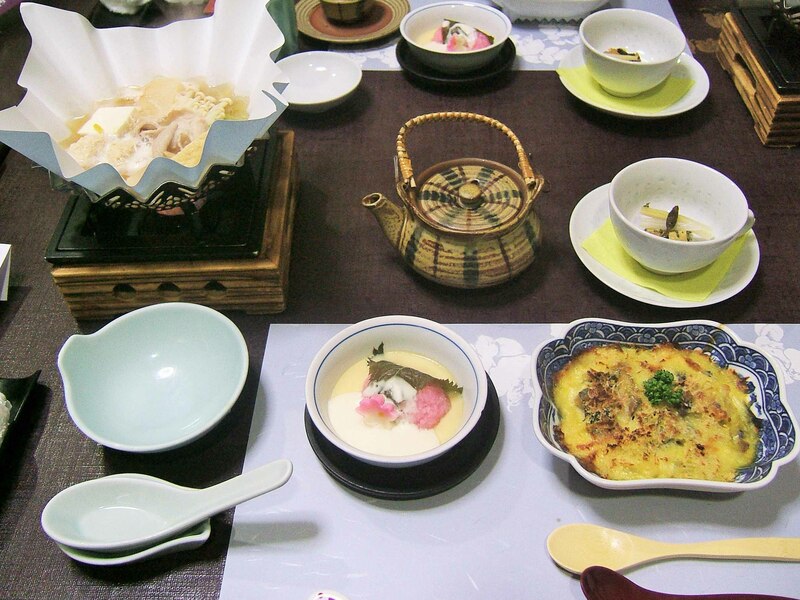 Followed by some slightly more western looking dish with full of local ingredients such as seaweed, prawn, bonito, clams and seasonal horsetail shoot. 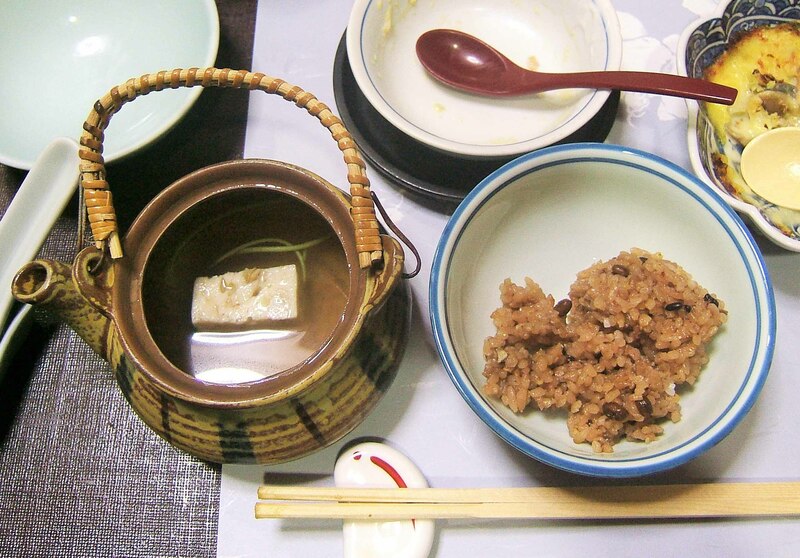 A hot pot with pork, tofu and vegetable was cooked on a small hob by using folded up Japanese paper ‘Washi’ as a cooking container instead of a pottery pot. Apparently paper does not burn on a fire as long as there is some liquid inside it. It looks nice and easy to tidy up in the kitchen … don’t need to wash up afterward? Clever idea. The third round we had rice and soup in a tea pot with tofu and some vegetable. We were given a choice of either just local white rice or a local one with 10 different grains. My mother chose white rice and I chose the latter one with good texture. Very tasty! 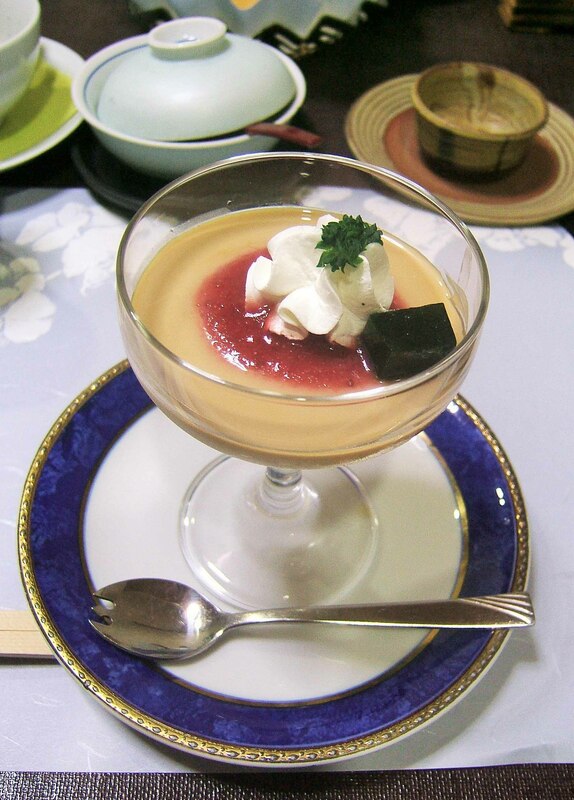 Finally, the dessert was ‘Houji-cha (roasted tea)’ Soy Milk Pudding with strawberry sauce. 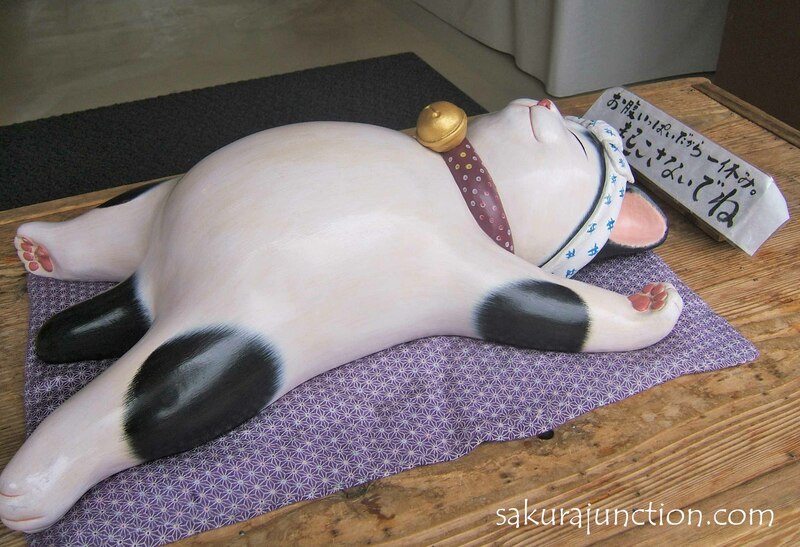 We started the following day by having a Onsen bath of course. Very luxurious! Then of course – Breakfast. After finishing breakfast we headed off to the Shinto Shrine ‘Ise Jingu (Naiku)’. It started raining later in the morning and it turned out to be a very cold day! 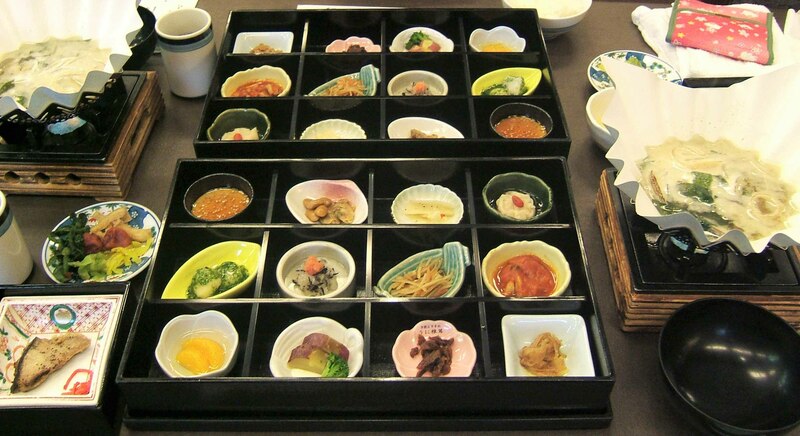 Wow, the meals are so beautiful! I’m glad you mentioned the tattoos. In America, tattoos are very popular, so it’s good to know about the rule for public baths there. Beautiful, aren’t they? 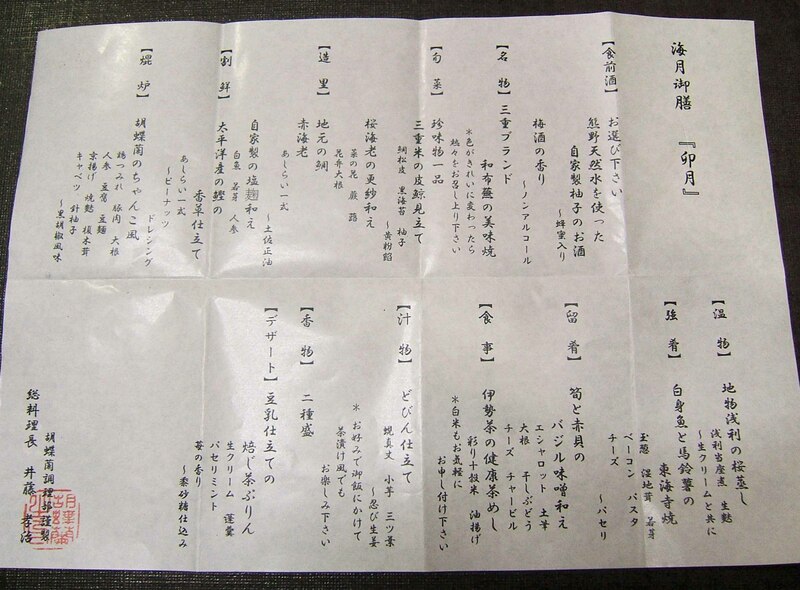 There must be many people with tatoos go to public bath in Japan without knowing the rule. I wonder what happens …?